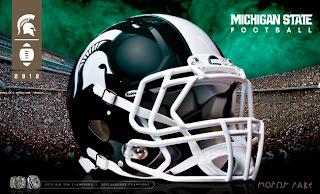 Michigan State took to a social media outlet to bash their arch rival Michigan during the Wolverines woeful loss to Defending National Champion Alabama this past weekend. Now the backlash is all on the Spartans because their head coach, Mark Dantonio, thinks his players showed classless taste in their remarks regarding Michigan players' performances. He deemed his players taunts "disrespectful", and suggested his guys "need to keep their mouths shut". It should be a lot of fun around the MSU practice fields this week. As they say, when the head coach ain't happy, nobody ain't happy. (I thought that was when Mama ain't happy...oh well, you get the point).